A Very Contrary Irishman – The Life and Journeys of Jeremiah O’Flynn by Paul Collins. Morning Star Publishing, November 2014. I was a child at the feet of my late maternal grandfather, a complex, wizened little man brought up in the bosom of the Salvos. They are a quirky branch cut from Methodism, in turn grafted from Anglicanism, duly divorced from Catholicism. I used to hear early 20th century stories of the wide political and religious-cultural chasm that existed between Australian Catholics and Protestants. It was a sectarian divide of suspicion and prejudice that is thankfully unknown to my children. It was a gap that was bridged sporadically by acts of kindness and fellow travail. 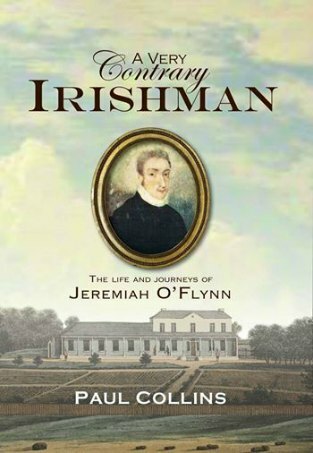 A Very Contrary Irishman – The Life and Journeys of Jeremiah O’Flynn is a labour of love that was researched, written and honed over several decades. Paul Collins presents a very human, driven man whose actions – and attributed actions – changed numerous lives and in some small ways helped to shape our culture. Collins is a History PhD with a flair for journalism and background in theology and philosophy. He uses A Very Contrary Irishman as a vehicle to transport us back to the temporal and spiritual rifts present in the colony of New South Wales. Many Catholics endured life under officially sanctioned neglect and sometimes oppression, and the story is well set against a wider world of sharp political and religious disputations. It turns on this truth: before monk-turned-priest O’Flynn arrived in the Antipodes’ penal possessions with the Pope’s blessing – yet without British permission or knowledge – the mass of Catholic transportees and emancipists and a considerable percentage of the colony’s military personnel were without spiritual solace or representation from a priest in Sydney town and Van Diemen’s Land. O'Flynn got the ball rolling for those sheep without a shepherd, against the wishes and judgement of the colony's masters (to whom Collins is not unsympathetic , in many respects). Macquarie’s deportation of O’Flynn for other climes marks a wobbly moment in Australian religious tolerance. O’Flynn presents as quite the rebel with a cassock, doesn’t he? With the author’s warts and all examination of his subject (who may or may not have had punch-ups with other clergy in other locales, and may or may not have knowingly attempted to deceive the ornery Governor Lachlan Macquarie), and authorial discussion of the nexus between history and myth, Collins looks to draw us into an (at times) dry search for lost truths. The seminal figure in the establishing years of Australian Catholicism, O’Flynn is placed by Collins in a rich tradition of clerical adventurers; spiritual nomads ‘with an almost compulsive need to travel to strange and far away places’. (Cue Sydney, with its forbidding Proddies, kangaroos and bizarre foliage.) Putting ourselves in a different culture and time requires vivid, empathic use of imagination; something Collins pursues on the back of solid and extensive research. It's not an easy (nor completely successful) effort. I confess my ignorance on long-past Catholic controversies over the understanding of, and devotion to, the Eucharist, that the decamped cleric may or may not have left in Sydney (and over who may or may not have consumed it). I am unaware of the emotional and cultural impact on Catholics of long ago, having been institutionally denied spiritual solace; but I sympathise and see that disregard reflected in current federal policies towards asylum seekers. What are we to make of our highly idiosyncratic protagonist? Collins contends that O’Flynn was no ‘D&M’ spiritual sojourner in the postmodern sense, but a feisty, committed priest of his time with a social conscience – a man who could comfort his various flocks by practising religion as ‘an external business of fulfilling the rituals correctly’. ‘This doesn’t mean that faith was absent,’ he adds, as ‘they saw the Mass and the sacraments as their gateways to the reality … which was “beyond” the everyday pedestrian world’. Perhaps walking in O’Flynn’s shoes may help us understand the Australia that kicked him out. Barry, while we do indeed learn about ‘Australia’s first unofficial non-convict Catholic priest’ in detail (down to what he ate as a Trappist monk, for instance), somehow the gist of the man described as 'impulsive and restless' escaped me. It’s curious, really. There’s no doubting Paul Collins’ painstaking research and cataloguing. A Very Contrary Irishman is a marvel of facts, dates, details and footnotes. Obviously, the mythical figure of Jeremiah Francis O’Flynn – aided by the outrageous belief that he’d left behind in NSW the Blessed Sacrament) has long haunted Collins – and he throws himself into the task of bringing the character to the page. O’Flynn travelled extensively around the globe, most notably, the Caribbean, Italy, the US and, of course, Australia. I know it’s parochial of me, Barry, but I must say that I found myself drawn to 'Chapter Four: An Unwelcome Arrival New South Wales'. And I especially enjoyed the fact that it was a 'Captain John Howard' who commandeered the ship that carried at least one illegal passenger on board—that being O’Flynn, himself—who arrived in NSW minus the relevant papers. Parochialism aside, this felt to me to be where the ‘real’ O’Flynn resided. Perhaps, here we also detect Collins’ own colonial pride, too. Not only can we well imagine the rogue priest busily, and unlawfully, giving communion, marrying and baptising willy-nilly, Collins, too, captures the simmering tension between O’Flynn and the NSW governor responsible for deporting the priest: Major-General Lachlan Macquarie. Despite O’Flynn’s aborted mission, Collins reminds us of his role in helping influence the British government to allow the first official Catholic missionaries to be sent to Australia in 1820. On this important point, Collins never wavers. But making history relevant for a contemporary audience always carries risk. Engaging the reader is easy said than done (I think back, Barry, to David Hunt’s Girt: The Unauthorised History of Australia, which achieved this thanks to a generous sprinkling of modern-day double-entendre). Not that I’m suggesting that A Very Contrary Irishman lends itself to humour. As it stands, the book is well positioned to attract historians and those with a particular interest in the infamous 'ecumenical tourist', but for me, Barry, Collins’s O’Flynn never quite manages to fully shake off the dust of the past. Jen Vuk is a freelance writer and editor, and Barry Gittins is a communication and research consultant for the Salvation Army. If looking for meddlesome priests, I recommend "The Last Armada", an account of an attempt by Phillip III of Spain to cash in on the aftermath of the execution of Essex by invading England through Ireland. The story has two priests, one a Spanish Franciscan (who managed to be named archbishop of Dublin, though he never set foot in the city) and an Irish-born Jesuit. Each interfered in the politics of the time and more significantly and disastrously in the military campaign. Thanks for your reviews this year, Jen & Barry. I've read only one book written by Dr Collins, "Judgment Day", and that was very good reading indeed. And history is a favoured subject of mine. So, I'll look out for it. I leave you both with a quote I hope you'll appreciate: "A dramatic critic is a man who leaves no turn unstoned. "(George Bernard Shaw). I'm all for equality, Jen, so perhaps wo-man could apply as well! A soldier's life is usually one of bursts of brief action followed by extended periods of drudgery and boredom, and never was this more true than during this dreadful war of attrition that dragged on apparently interminably between 1914 and 1918. A book titled Aussie was published in 1920 as a bound collection of AIF soldiers’ own paper of the battlefield, wholly written, illustrated and printed in the field. Sue will always be for me flesh and blood, her trust I will forever cherish. Hers was a wretched life from the beginning to the end. But for some reason I feel impelled to lift her name out of the anonymity narrative that includes the vast numbers of people who have gone before us.